Language of the Land: Journeys into Literary America: The inspiration for this exhibition was the Library of Congress's collection of literary maps--maps that acknowledge the contributions of authors to a specific state or region as well as those that depict the geographical locations in works of fiction or fantasy. Throughout the exhibition, these colorful and varied maps reflect the contributions of authors to specific states or regions and locate their imagined people and places. Through these maps, authors' words, images, and characters, Language of the Land presents a tapestry of the impressions that endure in our collective imagination of the American land and its culture. The Booklover's Map of the United States, Being a Literary Map of the United States, A Pictorial Chart of American Literature, Map of American Literature, Showing Points of Interest With Backgrounds and Facts That Influenced American Writers, Black Writers for Young America, The Beat Generation Map of America, A Literary Map of Arkansas, A Literary Map of the Commonwealth of Virginia, Modern Mississippi Writers: A Map of Literary Mississippi, A Literary Map of Indiana, Historical and Literary Map of Iowa, Nebraska Centennial Literary Map and Guide to Nebraska Authors, A Literary Map of Ohio, Wyoming Literary Map, The Literary Map of Los Angeles, & many more. 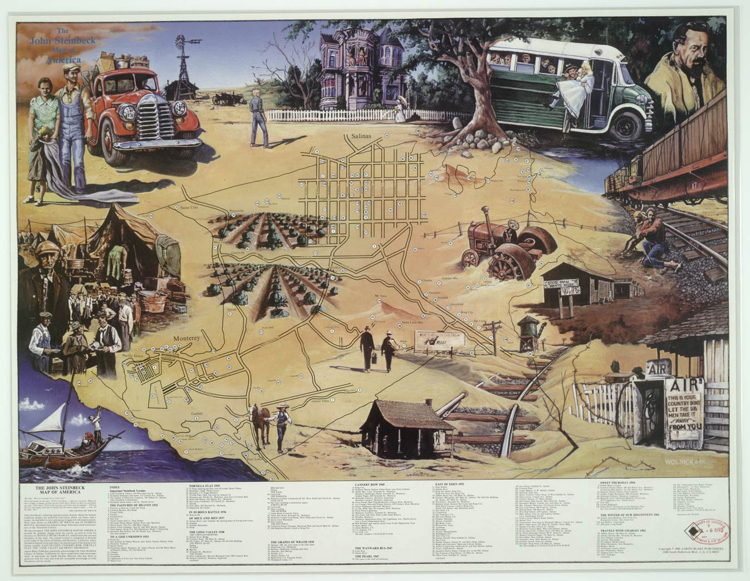 My personal favourite: The John Steinbeck Map of America features popular images from Steinbeck's novels such as Tortilla Flat (1935), The Grapes of Wrath (1939), and The Pearl (1947). These remind me of the paper placemats at a certain sort of diner- they would depict a map, of sorts, either for the tourists and presenting the area and local fauna as tremendously exotic and the local history as of vital national importance. Or the maps would be for the kids and also feature trivia from a previous generation's era - bafflingly so. These are great - a contemporary set would incredible. Nice set of links Fizz! Thank you. I dislike the way that the LOC image viewing is set up, but aside from that, it's a wonderful place to discover some hidden gems.